Summary of the impacts of megaherbivores (here green turtles, Chelonia mydas) on invasive expansion (here seagrass Halophila stipulacea), and the changes of seagrass species co-occurrence following the introduction of H. stipulacea to the Caribbean. In tropical seagrass ecosystems, herbivory can facilitate invasive species expansion by a hypothetical positive feedback mechanism. Green turtles selectively graze on native seagrass species Thalassia testudinum (Fig. 2) that have higher nutritional value (happy emoticon; Fig. 3) and rarely choose to eat invasive seagrass (sad emoticon). By leaf cropping, turtles open up the leaf canopy (i.e. shorter leaves, lower shoot density), which can facilitate the settlement and expansion of invasive seagrass (thicker arrow), as found in our experiments (Fig. 4). 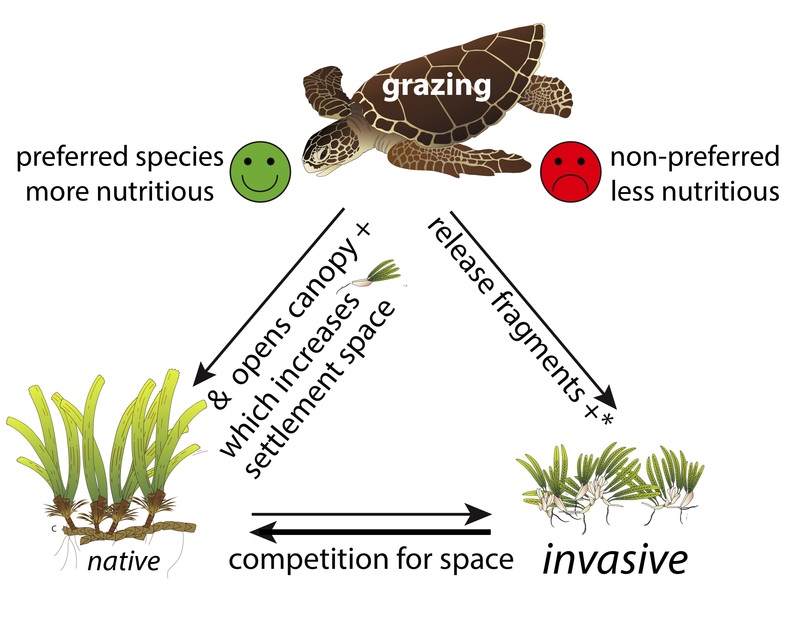 As the biomass of native seagrass species gets scarcer, turtles search for new local grazing locations with native seagrass and initiate grazing patches in shallower areas that were previously ungrazed (Fig. 1). As a result, invasive seagrasses can spread into these newly cropped patches in shallow areas (Fig. 5) and may replace native seagrasses. ‘+’: increase. Figure created by MJAC, using images provided by the Integration and Application Network, University of Maryland Center for Environmental Science (ian.umces.edu/imagelibrary/).